The AyeGear® J25 is suitable for both cold, with a concealed hood for rain/snow protection and waterproof lining, and hot climates - with removable sleeves and breathable lining. • 2x Large Pockets for a Tablet, iPad or a Macbook 12"
• 1x Large Compartment to hold a Laptop of upto 15"
FORBES Review:"Not only is the jacket warm and comfortable, but it is the ultimate 'jacket of holding' for the geekerati who lives in inclement weather...AyeGear has found a problem, decided to address it, and hit the solution out the park"
Herald Scotland Review:"It's got my nomination for product of the year...10/10. 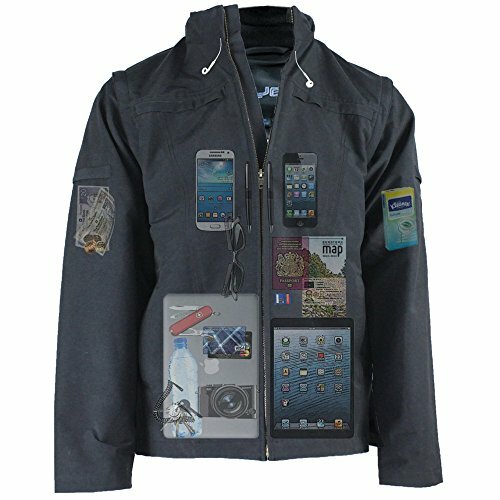 The gadget toolbox you can wear"
The Ultimate Jacket with 25 Pockets and Detachable Sleeves - This jacket can be transformed into a Vest / Gilet. FORBES REVIEW:"Not only is the jacket warm and comfortable, but it is the ultimate 'jacket of holding' for the geekerati who lives in inclement weather...AyeGear has found a problem, decided to address it, and hit the solution out the park". HERALD SCOTLAND REVIEW:"It's got my nomination for product of the year...10/10. The gadget toolbox you can wear"
2x Touch Sensitive Pockets for Smartphones - This allows you to use your smartphone within the jacket's pocket itself. The clear film on the pocket will not only let you view your smartphone screen but will also let you swipe & type through the pocket which makes it ideal when your on the move & especially when there is heavy rain/snow. Very easy & simple to use. Compatible with all brands & sizes of smartphones such as Apple iPhone 6/6s/6 PLUS, Samsung Note, Samsung Edge, Nokia Lumia, HTC,etc. Detachable / Removable sleeves and Concealed Hood - The sleeves can be removed very easily by simply unzipping the concealed zips under the arms of the jacket which then transforms the jacket into a vest so that you can comfortably wear it in warmer climates. The hood is stored in a discreet zipped pocket on the back of the collar. The hood is ideal to use during the snow / rain / cold weather. Waterproof, Windproof and Breathable - Designed for both hot and cold climates. Suitable for all weather and purposes. Ideal for travellers, students, sports enthusiasts, camping, festivals, concerts and more. Use your lightweight jacket as a carry-on and forget ever having to pay for excess baggage charges ever again! Sizes available for both men and women. This jacket is a must have for anyone! If you have any questions about this product by AyeGear, contact us by completing and submitting the form below. If you are looking for a specif part number, please include it with your message.